For other uses, see Chicago school (disambiguation). While the term "Chicago School" is widely used to describe buildings constructed in the city during the 1880s and 1890s, this term has been disputed by scholars, in particular in reaction to Carl Condit's 1952 book The Chicago School of Architecture. Historians such as H. Allen Brooks, Winston Weisman and Daniel Bluestone have pointed out that the phrase suggests a unified set of aesthetic or conceptual precepts, when, in fact, Chicago buildings of the era displayed a wide variety of styles and techniques. Contemporary publications used the phrase "Commercial Style" to describe the innovative tall buildings of the era rather than proposing any sort of unified "school". Some of the distinguishing features of the Chicago School are the use of steel-frame buildings with masonry cladding (usually terra cotta), allowing large plate-glass window areas and limiting the amount of exterior ornamentation. Sometimes elements of neoclassical architecture are used in Chicago School skyscrapers. 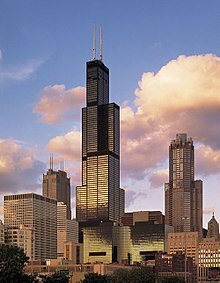 Many Chicago School skyscrapers contain the three parts of a classical column. The lowest floors functions as the base, the middle stories, usually with little ornamental detail, act as the shaft of the column, and the last floor or two, often capped with a cornice and often with more ornamental detail, represent the capital. The "Chicago window" originated in this school. It is a three-part window consisting of a large fixed center panel flanked by two smaller double-hung sash windows. The arrangement of windows on the facade typically creates a grid pattern, with some projecting out from the facade forming bay windows. The Chicago window combined the functions of light-gathering and natural ventilation; a single central pane was usually fixed, while the two surrounding panes were operable. These windows were often deployed in bays, known as oriel windows, that projected out over the street. Architects whose names are associated with the Chicago School include Henry Hobson Richardson, Dankmar Adler, Daniel Burnham, William Holabird, William LeBaron Jenney, Martin Roche, John Root, Solon S. Beman, and Louis Sullivan. Frank Lloyd Wright started in the firm of Adler and Sullivan but created his own Prairie Style of architecture. In the 1940s, a "Second Chicago School" emerged from the work of Ludwig Mies van der Rohe and his efforts of education at the Illinois Institute of Technology in Chicago. Its first and purest expression was the 860–880 Lake Shore Drive Apartments (1951) and their technological achievements. This was supported and enlarged in the 1960s due to the ideas of Chicago structural engineer Fazlur Khan. He introduced a new structural system of framed tubes in skyscraper design and construction. The Bangladeshi-born engineer Fazlur Khan defined the framed tube structure as "a three dimensional space structure composed of three, four, or possibly more frames, braced frames, or shear walls, joined at or near their edges to form a vertical tube-like structural system capable of resisting lateral forces in any direction by cantilevering from the foundation." Closely spaced interconnected exterior columns form the tube. Horizontal loads, for example wind, are supported by the structure as a whole. About half the exterior surface is available for windows. Framed tubes allow fewer interior columns, and so create more usable floor space. Where larger openings like garage doors are required, the tube frame must be interrupted, with transfer girders used to maintain structural integrity. The first building to apply the tube-frame construction was the DeWitt-Chestnut Apartment Building which Khan designed and was completed in Chicago by 1963. This laid the foundations for the tube structures of many other later skyscrapers, including his own John Hancock Center and Willis Tower, and can be seen in the construction of the World Trade Center, Petronas Towers, Jin Mao Building, and most other supertall skyscrapers since the 1960s. Today, there are different styles of architecture all throughout the city, such as the Chicago School, neo-classical, art deco, modern, and postmodern. ^ "Commercial style definition". Dictionary of Wisconsin History. Wisconsin Historical Society. Retrieved 2007-06-26. ^ a b Billington, David P. (1985). The Tower and the Bridge: The New Art of Structural Engineering. Princeton University Press. pp. 234–5. ISBN 0-691-02393-X. ^ "Evolution of Concrete Skyscrapers". Archived from the original on 2007-06-05. Retrieved 2007-05-14. ^ Ali, Mir M. (2001). "Evolution of Concrete Skyscrapers: from Ingalls to Jin mao". Electronic Journal of Structural Engineering. 1 (1): 2–14. Retrieved 2008-11-30. 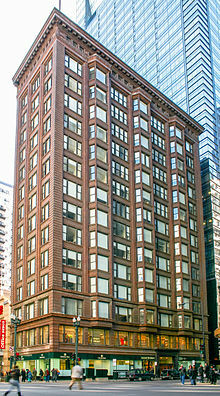 Wikimedia Commons has media related to Chicago School architecture in the United States. Condit, Carl W. The Chicago school of architecture: a history of commercial and public building in the Chicago area, 1875-1925. University of Chicago Press, 1973. Leslie, Thomas. Chicago Skyscrapers, 1871-1934. University of Illinois Press, 2013.